I scanned this from the 2007 Tsubasa/xxxHolic Calendar. This is the November illustration, which was also the color splash page for manga volume 10.
so so so beautiful ! Thanx for all u're amazing CLAMP scans! OMG I still need my calendar. Aww. Ahh thank your for sharing this with us! Oh my God he ( Watanuki kun loook so cool and handsome too!) he has ever been like that before. i love him so much>_< ! like omg! i love the whole collection! and u rock too for sharing all this! watanuki look soooooo nice! he IS a lady killer! maybe not really in his world, but in this world, YAA! Thanks for sharing such a beautiful scan. OMG a nice watanuki here! ;D very very thnax for sharing fav! It is really a wonderful scan, the artwork is sooooo beautiful! Really awesome, and cute too... Thanks 4 sharing! wow! that's such a great scan O_O. Omedeto! another wonderful scan, thank you, thank you for sharing. Wow! A really lovely scan of Watanuki-kun! I'll have to check out the scans for the others months as well! Thanks lots! This scan simply takes my breath away... And it's so large! Thank you for sharing! 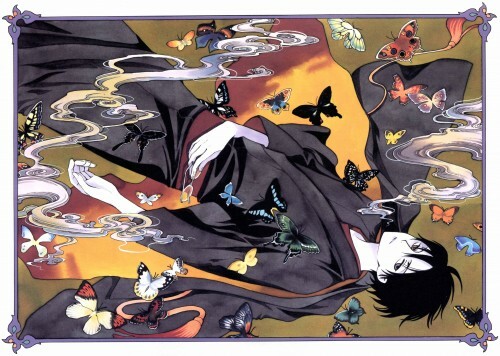 Thanks for this absolutely gorgeous scan.. Watanuki is so pretty here! I love the butterflied in this picture. And Watanuki's pose is cool...I bet someone's vectored it already.